After Hurricane Katrina, the United States Justice Department created the National Center for Disaster Fraud (NCDF) because insurance fraud often increases after catastrophes. Now, after Hurricane Irma, the NCDF announced they are working in collaboration with U.S. Attorney’s Offices for the Southern District of Florida, Middle District of Florida, and Northern District of Florida to create task forces of local, state, and federal agencies to crack down on illegal insurance activities. Officials have made it clear that they will aggressively pursue individuals suspected of fraudulent activity in the federal court system. If you have been convicted of fraud in the wake of Hurricane Irma, you will want to be represented by a Florida attorney who has experience successfully getting charges dismissed and litigating cases in the federal courts. If the fraudulent activity violated federal laws or was an attempt to secure benefits from federal disaster relief agencies, then the charges can be brought to a federal court. Federal courts are known for being more severe with sentencing. 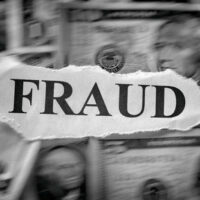 If you have been charged with fraud against the government, you need to seek immediate legal advice from a qualified West Palm Beach attorney. By means of willful misrepresentation or a fraudulent pretense, promise, or representation. Greater than $50,000, the defendant will be charged with a first degree felony, punishable by a maximum of 30 years in prison and serious fines. Price gouging – It is illegal to grossly overcharge a customer after a natural disaster. Under Florida Statute 510.160 the price can not significantly exceed the average cost for the service or product 30 days prior to the disaster unless there is a legitimate reason for the increase. False claims – This includes reporting damages that never occurred to an insurance company or the federal government. Identity theft – Identity theft after a disaster often occurs when a person files a claim using another person’s information who had been affected by the storm so that they receive insurance money meant for the person who experienced the damages. Charity fraud – Soliciting for charitable giving or donations for one’s own financial benefit. Other fraudulent activities – Impersonating law enforcement, promising high investment returns for people financially helping the affected area, and other activities meant to deceive the public or government. We urge you to immediately reach out to an experienced West Palm Beach federal or state fraud attorney for assistance if you have been charged with a crime or are under investigation. Your entire future may be at stake, and you may be facing serious jail or prison time. Call the Skier Law Firm today for assistance.